New Orleans, Louisiana is a great American city. During my brief stay in March of this year, I thoroughly enjoyed the seafood jambalaya, the charming architecture of the French Quarter, the Mardi Gras Indians parading on Super Sunday—and of course, the jazz: the intricate, lovely, boisterous, life-affirming jazz. I encourage everyone to visit. I had a wonderful time, and can’t wait to go back. Nevertheless, the city of New Orleans has suffered, and continues to suffer, from planned chaos that keeps it from being even more fabulous. The Mother’s Day parade shooting that injured 19 this past weekend is only one small instance of the city’s failings. During a drive around town, I saw many houses still boarded up, evidence of the devastation caused by Hurricane Katrina eight years ago this summer. On the face of it, there is no chaos more unplanned than a hurricane, which strikes unpredictably with unpredictable force. Still, certain areas are hit with hurricanes on a regular basis. The Gulf Coast of the United States is one of those areas. Indeed, according to a bipartisan Congressional investigation into Katrina and its aftermath, poor planning had a lot to do with this tragic event: “It remains difficult to understand how government could respond so ineffectively to a disaster that was anticipated for years, and for which specific dire warnings had been issued for days. This crisis was not only predictable, it was predicted.” The hurricane itself cannot be blamed on government, but the failure to prepare and respond appropriately can and should. 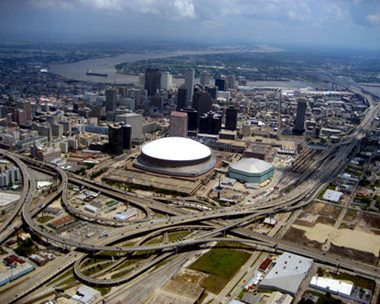 The most obvious failure to prepare was the inadequate levees protecting New Orleans from flooding. Most of the metropolitan area is actually below sea level, making it particularly vulnerable to hurricanes. After Hurricane Betsy hit New Orleans in 1965, killing 81 and injuring thousands, the US Army Corps of Engineers built tall embankments, or levees, along the Mississippi River and other waterways. However, according to the Congressional report, “The levees protecting New Orleans were not built to survive the most severe hurricanes. It was a well-known and repeatedly documented fact that a severe hurricane could lead to overtopping or breaching of the levees and flooding of the metropolitan area.” The report also states that “responsibilities for levee operations and maintenance were diffuse.” The question was not if the levees would fail, but when they would fail. On August 29, 2005, they failed. Hurricane Katrina killed nearly 2,000 people and caused over $100 billion in damages, with the death and destruction both concentrated in New Orleans. In early 2008, a Federal District Court judge found that the US Army Corps of Engineers was guilty of “gross incompetence.” He was unable to actually hold them liable, however, because the Flood Control Act of 1928 grants legal immunity to the government in such matters. "It has become increasingly clear that local, state, and federal government agencies failed to meet the needs of the residents of Louisiana, Mississippi, and Alabama." "Our investigation revealed that Katrina was a national failure, an abdication of the most solemn obligation to provide for the common welfare." "We found many examples of astounding individual initiative that saved lives and stand in stark contrast to the larger institutional failures." "The Select Committee identified failures at all levels of government that significantly undermined and detracted from the heroic efforts of first responders, private individuals and organizations, faith-based groups, and others." Predictably, the drafters of the report, while severely criticizing government preparation for and response to Hurricane Katrina, simply called for government to be better. They wrote, “We again encountered the risk-averse culture that pervades big government, and again recognized the need for organizations as agile and responsive as the 21st century world in which we live.” But it is pointless to hope that big government will mend its ways. Nowhere and never has big government been agile and responsive. For traits like these, we need to turn to agents on the free market. How would free markets have produced less planned chaos and more spontaneous order in preparation for and response to Hurricane Katrina? Governments are just made up of people, after all. Why should we expect people to act and react more appropriately in a market setting? In a word, incentives. As the public choice school of economics has taught us, politicians’ and bureaucrats’ incentives are skewed toward getting elected, getting re-elected, amassing power, and covering their asses. They tend to be drawn to programs and policies with visible, concentrated, upfront benefits and hidden, diffuse, down-the-road costs. Programs and policies that fail are often rewarded with more responsibility, more staff, and more money. Market players, on the other hand, are tuned in to the information contained in price signals and exposed to the rigours of competition. If they try to ignore what their employers, customers, suppliers, and others are telling them, they suffer the consequences. If they act rationally, exercising appropriate prudence, intelligence, and effort, they tend to reap the rewards. It is impossible to say exactly how things would have played out in the summer of 2005 if New Orleans had benefited from freer markets and less government, but thinking about how markets incentivize people can suggest some possibilities. Most obviously, not having legal immunity from “gross incompetence,” private contractors would have had good reason to build levees that would stand up under pressure in the first place. Those in charge of maintaining those levees would also have had a greater incentive to do their jobs. Alternately, if the danger of flooding were not effectively guarded against, insurance companies would raise premiums or refuse to provide coverage at all, sending a signal to the market that some action was required. With skin in the game, unlike bureaucrats and politicians, property owners would be incentivized to take appropriate action. The Congressional report is entitled “A Failure of Initiative,” but the devastation caused by Hurricane Katrina was really due to a failure of incentives. Government agents’ incentives are skewed, and government programs and policies often end up skewing everyone else’s incentives too. Free markets—as long as they are not undermined by the actions of governments and their privilege-seeking clients—punish failure and reward success. They thereby provide incentives for people to see to their own long-term interests, and so give rise to a spontaneous order no central planner could ever come close to imitating. For better natural disaster preparation and response, what the world needs is less planned chaos and more unplanned order.